Oregon’s scenic coastline on the Pacific Ocean extends the length of the state, about 296 miles. The Columbia River flows along more than half of Oregon’s northern border with Washington and the Snake River runs along half of its eastern border with Idaho. Other major rivers in Oregon include the Deschutes, the John Day, and the Willamette. More than 80 natural and artificial lakes are in Oregon with Crater Lake being the deepest lake in the United States. With its offshore and inland waters, a little over 2% of Oregon is covered with water (2,383 square miles). What is Oregon’s maritime heritage? Native settlements along Oregon’s rivers, coastal estuaries, and lakes are at least 10,000 years old. The earliest contact with Europeans is not recorded but likely was not before 1565 when Spanish galleon traders sailing from Manila to Acapulco discovered a new route along the coast of North America. During the last quarter of the 18th century, European and American maritime expeditions began exploring the Northwest Coast and trading for furs with Native Americans. By 1805, the land-based expedition of Meriwether Lewis and William Clark reached the mouth of the Columbia River. The discoveries made during these expeditions brought great changes to Oregon Country beginning with the influx of fur trading companies established along rivers in places like Astoria and Fort Vancouver. By sea, supplies and trade goods were brought in, furs were directly exported to China, and timber, salted salmon, agricultural products, and manufactured goods were shipped to coastal towns in what are now Alaska, California, Hawaii, Oregon, and Washington. Although the fur trade declined by the early 1840s, waves of immigrants came via the Oregon Trail for land and new opportunities. The discovery of gold in California in 1849 was an economic boon to Oregon, which began shipping large quantities of timber, agricultural products, and seafood to San Francisco by sea. After the Oregon Territory was created in 1848, the U.S. Coastal Survey charted the coastline and the U.S. Lighthouse Establishment constructed nine lighthouses along the coast. The waters where the Columbia River meets the Pacific Ocean are particularly treacherous because of strong cross currents and shifting sandbars. Mariners refer to the area as the “Graveyard of the Pacific” because about 2,000 ships have sunk, stranded, or disappeared since the first recorded maritime casualty in 1792. Some shipwrecks are completely buried in Oregon’s beaches, becoming temporarily visible after severe storms. At least five such sites reappeared in 2007 including the Acme, wrecked in 1924 near Brandon, the Bella, sunk in 1905 near Florence, the Emily Reed, sunk in 1908 near Rockaway, the George L. Olson, run aground in 1944 near Coos Bay, and an unidentified wreck near the Umpqua River. 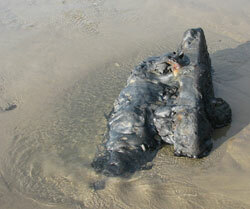 An exciting reappearance in 2008 near Arch Cape was two cannon that probably are from the 1846 wreck of the USS Shark. The Oregon Parks and Recreation Department recovered the cannon under an archeological permit for conservation, study, and public interpretation. One largely intact hulk buried in 40 feet of water off Cape Disappointment is the Hudson’s Bay Company supply ship Isabella. 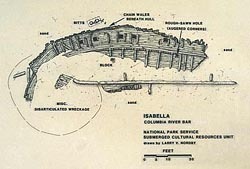 Built in 1825 and wrecked in 1830, the Isabella shipwreck site is the only known example in the United States of its type that once was common. In 1987, working under an archeological permit, the National Park Service assessed and mapped the site, which is located on state submerged land and the property of the State of Oregon. The site is listed in the National Register of Historic Places as nationally significant. Who takes care of Oregon's underwater archeological sites? The Oregon Parks and Recreation Department has overall responsibility for the state’s Heritage Programs. The Department accomplishes this work through its State Historic Preservation Office and several commissions and advisory groups. The Historic Preservation Office manages and administers programs aimed at protecting the state’s historic and cultural sites. The Office maintains an inventory of the state’s historic properties including a shipwreck database of known wreck sites along the Oregon coast. The Office advises state and local government officials, property owners, and preservation groups on ways to better protect and preserve the state’s cultural heritage including archeological sites on land and under water. The Office also issues permits for archeological investigations on state and local government lands and for excavations at known sites on private lands. You need a permit from the State Parks and Recreation Department to excavate or alter an archeological site, make an exploratory excavation to determine the presence of an archeological site, or remove any material of an archeological, historical, prehistorical or anthropological nature. This includes sites on lands owned by the State of Oregon, a city, a county, a district, or a municipal or public corporation in Oregon. It also includes certain activities at sites on privately owned lands. Applications must include a research design and detailed map and provide information about the qualifications of key personnel, the identity of the landowner or land managing agency, and the curatorial facility. What laws concern underwater archeology in Oregon? Oregon considers its cultural heritage to be one of the state’s most valuable and important assets. Several laws in the Oregon Revised Statutes provide for the protection and management of the state’s archeological sites including sites underwater. This includes Chapter 97.740 et seq., about Indian graves and protected objects, Chapter 274 on submersible and submerged lands, Chapter 358.905 et seq., about archeological objects and sites, and Chapter 390.235 et seq., about archeological sites and historical material. Regulations governing archeological permitting are in Chapter 736-051 of the Oregon Administrative Rules.